That’s right! I am lucky enough to be one of the bloggers featured in the paperback version of Scarlet by Marissa Meyer! I reviewed both Cinder and Scarlet and will be reviewing Cress once I can get my hands on a copy of one. Can you find my Confessions from a Bibliophile? Want to check out my review of Scarlet? Find it here. 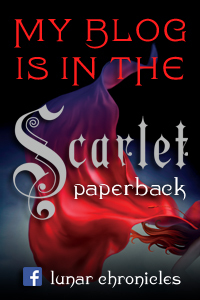 The Scarlet paperback arrives on Tuesday February 4. Don’t forget! Cress also releases on Tuesday February 4. This entry was posted in Uncategorized and tagged Cress, Marissa Meyer, scarlet, Scarlet paperback. Bookmark the permalink.